Ann Holder, who has served as interim director of the Sam Houston State University Newton Gresham Library for the past four years, has been named library director, effective Sept. 1. "Ann has done a wonderful job as interim librarian in improving the quality and user friendliness of the library," said David Payne, vice president for academic affairs. "We are pleased to see her appointment made permanent." Holder shares Payne's sentiments in the selection. "I'm excited," Holder said. "I think the library on this campus has an awful lot to offer, and we're going to try very hard in the next year with the renovation going on to make sure that they (students and faculty) have access to all of the services. "I'm really very appreciative in the confidence Dr. Payne and Dr. Gaertner are showing in me by moving me into the position," she said. As director, Holder hopes to continue to serve the students and faculty with a wide variety of resources and technology, as well as familiarizing them with the new technology being brought in. "We're bringing up instructional modules on the web to show people how to use the online catalog and a variety of databases," she said. "We'll offer something called a virtual reference desk, where you will be able to have a librarian work with you over the Internet on how to research a topic and how to use a database to help you find the best resources. "We're going to try very hard to make people aware that electronics are wonderful-they're so convenient in this world, but there is still a great deal of material that's sitting in this building, and I think people are missing a lot of information and research that's very valuable by staying just with the electronics," she said. Previously, Holder has worked in the map library at the University of Georgia and at Emory University in the general reference, copy services, microforms and acquisitions areas. In addition, she has served as interim science librarian, social science librarian, reference librarian and associate director of the library at SHSU. 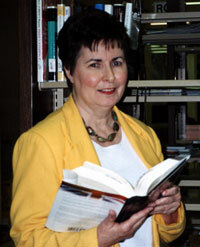 She became interim director in 1999, after former director Richard Wood resigned to become the director of university libraries at the University of South Alabama in Mobile. Holder received her bachelor's and master's degrees in library science from George Peabody College for Teachers, now part of Vanderbilt University, in Nashville. "I'm probably one of the few librarians in this building who actually had a plan when I went to undergraduate school that what I wanted to be was a librarian," she said. "And that's what I did." In the ever-changing profession, the interaction with people makes the job enjoyable, Holder said. "Love of books is part of it-I love books, I love reading, I love finding information-but what I found most intriguing, I think, was the fact that I could put people and information together," she said. "It's a service, but it's also something that stimulates your mind. People ask questions and you help them find the answers to those questions. It's very people-oriented, it's very detailed and it's a lot of fun. I like what I do, and I can still say that after all these years."